Starting with a motion study of our convertible top. Automatically transferring loads data from the motion to the structural optimizations. Applying shape controls and optimization variables to generate shapes based on our specific needs. We learned in Part 1 that the greatest value from analysis comes when we use it at phase 0 of our design … just as we have that napkin sketch idea. Inspire , via the "magic" of the OptiStruct solver (https://altairhyperworks.com/product/OptiStruct) , will then help us develop a structure that meets our performance criteria. Verification Run on "PolyNURBed" Brackets and Links in Convertible Top Assembly. worst case loading, top locked full cylinder forces applied. 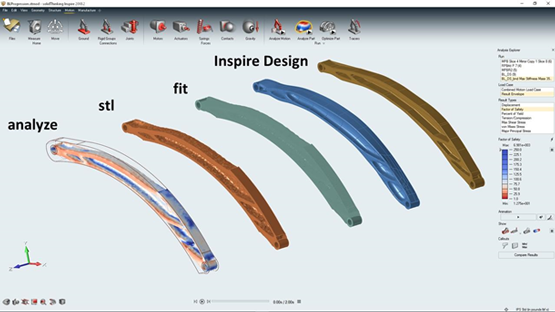 One of the more common questions about the shape outputs is “What can I do with them?” We have multiple options to use them immediately for printing or analysis and to use them as guides to further generate geometry in Inspire or other design tools. 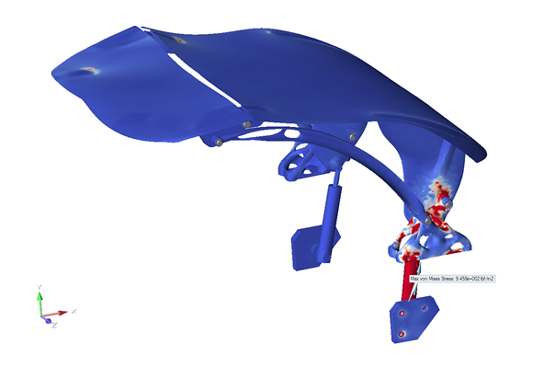 Adjust the shape with the shape explorer and then evaluate stress and deflection on the optimized geometry to get the "warm and fuzzies" on our actual deflection and stress levels of the optimized design. Export stl mesh representation of the optimization as a template to "draw over" in CAD or to further manipulate with your favorite stl editor. Fit and smooth the shape which can then be exported as a parasolid. Remaster with Inspire using geometry tools such as PolyNURBs or converting cross sections of the shape to sketches. In addition, here is a more detailed video showing the tools used to generate PolyNURB shapes. Beware, modeling with PolyNURBS is both powerful and addictive! If this looks inspiring, go ahead and download a trial and give Inspire and PolyNURBs a try. Thanks for reading. Check out our Manufacturing Video & Resource Library for other related content. solidThinking employs a relentless focus on delivering innovative technology with a streamlined user experience. Its tools empower users and organizations to make informed decisions and design, engineer, manufacture, and deliver amazing products to market faster than ever before. solidThinking’s tools are sold and supported through a global network of industry and domain experts.